"I believe there is a disease in the United States and that is the addiction to sanctions," he told CNN, adding that, "Even during the Obama administration the United States put more emphasis on keeping the sanctions it had not lifted rather than implementing its obligation on the sanctions it lifted." [post_ads]Zarif retained a clear belief during the hourlong interview in the foreign ministry that the nuclear deal could be revived regardless of the Trump administration denunciation of it. In May, Trump withdrew from the deal, known as the JCPOA and intended to limit Iran's nuclear ambitions in exchange for sanctions relief, calling it a "horrible one-sided deal that should have never, ever been made." The first wave of sanctions that were to "snap back" under the Trump move hit the import of car parts and precious metals on August 6. Earlier that day, he tweeted criticism of the US State Department last week establishing the "Iran Action Group" to coordinate the US and its allies pressure on Iran. He wrote: "Now an action group dreams of doing the same through pressure misinformation and demagoguery -- never again." For much of the interview, Zarif appeared to dismiss the possibility of future talks with the Trump administration, and maintain the hope the deal can be revived. He said pressure from the European allies could persuade Trump to change his mind and accused the United States of "bullying" the European signatories to the deal. 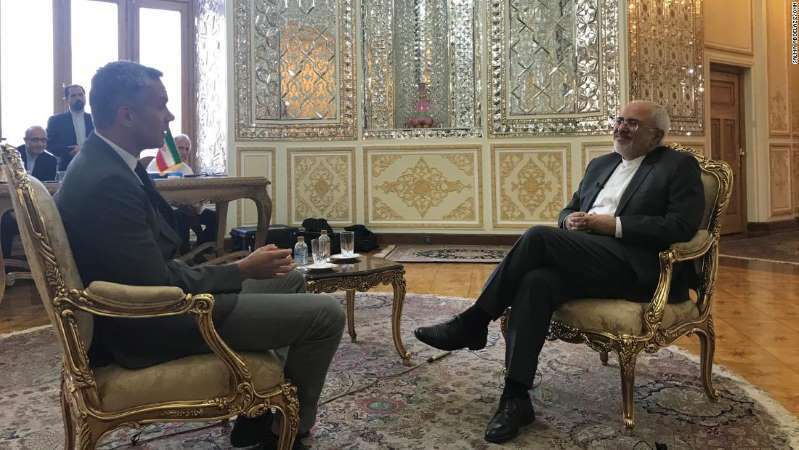 Asked whether Iranian President Hassan Rouhani could benefit from a one-on-one meeting with President Trump -- as Trump has preferred to tackle North Korea and Russia -- Zarif said the previous nuclear deal had to be respected first. "Not when the previous huge progress that we made was thrown out," he said of a one-on-one. "That [previous deal] was for us the litmus test of whether we can trust the United States or not." Would a lasting pact ever be possible with the man who wrote about the "art of the deal"? "It depends on President Trump -- whether he wants to make us believe that he is a reliable partner," he said. "Now if we spend time with him and he signs another agreement. ... How long will it last? Until the end of his administration? Until he departs from the place where he put his signature on the agreement?" Further sanctions are due to kick back in early November against the Iranian oil industry, which accounts for a fifth of Iran's GDP. Zarif said decades of pressure meant the Iranian people would be resistant to this pressure, yet it would have an impact. "US sanctions have always hurt," he said. "What it's hurting, though, is people who want to buy medicine. People who want to buy food." The United States denies it is targeting money that affects health care or agriculture, and says internal mismanagement and corruption are also to blame for rising food prices. In Iran's complex politics, where moderates and conservatives often vie for power, Rouhani and Zarif's decision to pursue the nuclear deal risked tying their political futures to the idea of active diplomacy with the West. "We spent a lot of time" he said, of the yearslong, intense and detailed negotiations that he and then-US Secretary of State John Kerry led. "It was not an easy political decision for the Iranian government and for me personally and for President Rouhani. It may be a credit for some foreign ministers to spend hours upon hours with the US secretary of state but it's certainly not a credit in Iran." Yet he accepted: "That's what diplomats are for. Part of our salary is to take personal hits for following national interests -- that's what our job is."